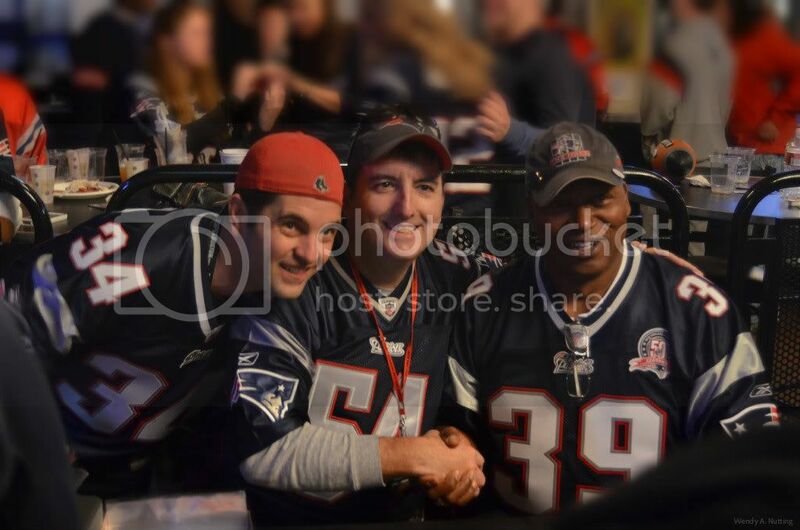 Clyde and I have never been to a pro football game so when the New England Patriots were scheduled to play the Seattle Seahawks, we knew we wanted to attend the game. Single tickets went on sale at 10am August 27th and by 10:45am they were sold out! But with a quick call to a ticket broker I had secured 2 tickets in our price range, aka the nose bleed section, by 11:30am. 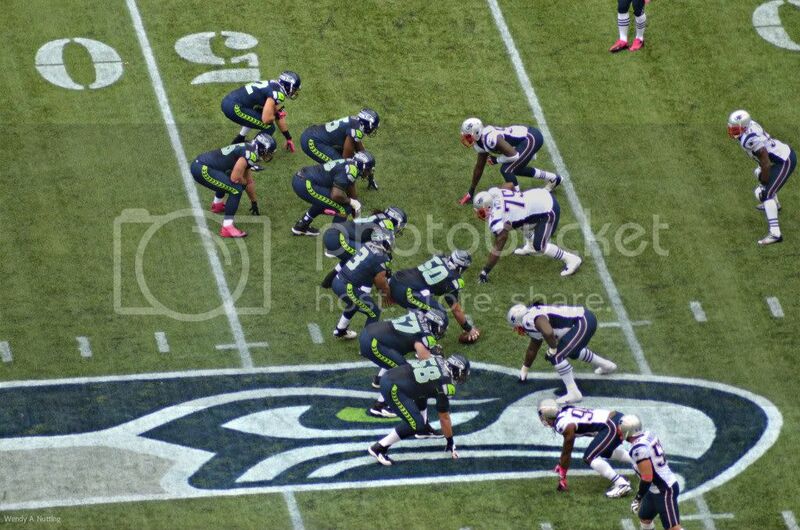 The Patriots rarely play the Seahawks so this was a special event for us. Now keep in mind we always root for our Seattle teams unless they play against the teams we grew up with. I was even more excited when I received a message via Facebook that a high school friend was flying out to Seattle with another friend for the weekend to root for "his" Patriots. I had not seen Scott since graduation in June of 1988 and we made plans to arrive early and meet up for brunch before the game. It was great! Scott and his buddy Jeff met Clyde, myself and another high school friend Shanna for some pre-game urban tailgating. 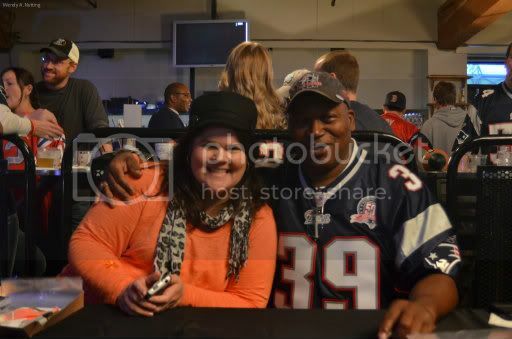 After brunch we headed over to the Showbox SODO and happened upon the tail end of a VIP event where we met, and took photos with Hall of Fame inductee, Sam "Bam" Cunningham, a former Patriot's full back. I know what you are thinking, how much do I really follow football, right? Well, when in Rome. It was exciting, it added to the festivities of the day and well, why the heck not? 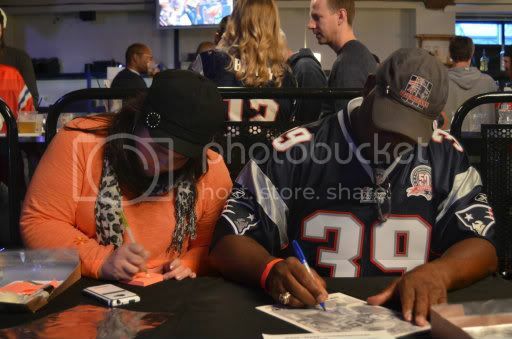 This might just be the only time I have the opportunity to meet a pro football player, get an autographed photo and have my picture taken with him. Carpe Diem! 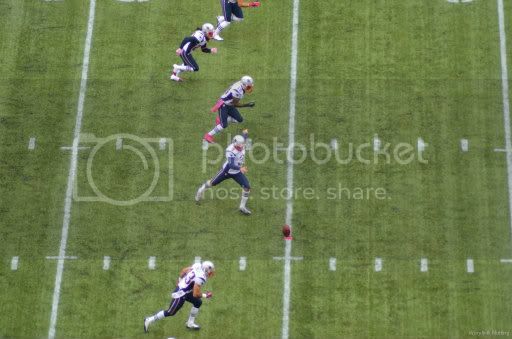 That would be my Patriots unicorn right there baby! With a half an hour to kick off we headed over to the stadium where 67,000 screaming fans would soon huddle together in a whirling frenzy full of passion and energy also know as American football. Funneling into the stadium proved to be a bigger challenge than I had expected and we did not make it very far before the gridlock set in. 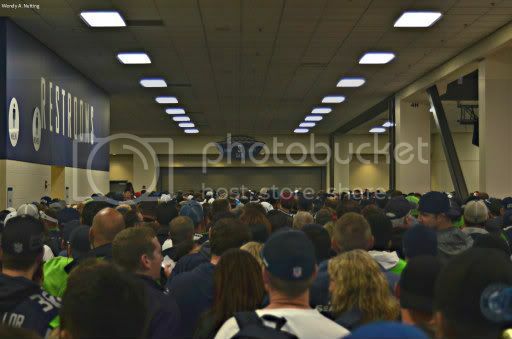 Most of the crowd was friendly as we slowly shuffled passed the entrance, down the hall way and through the turnstile into the stadium. 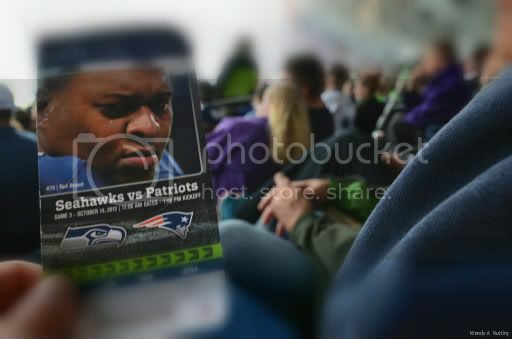 One Seahawks fan even shared his bag of chips with us in an act of general camaraderie. 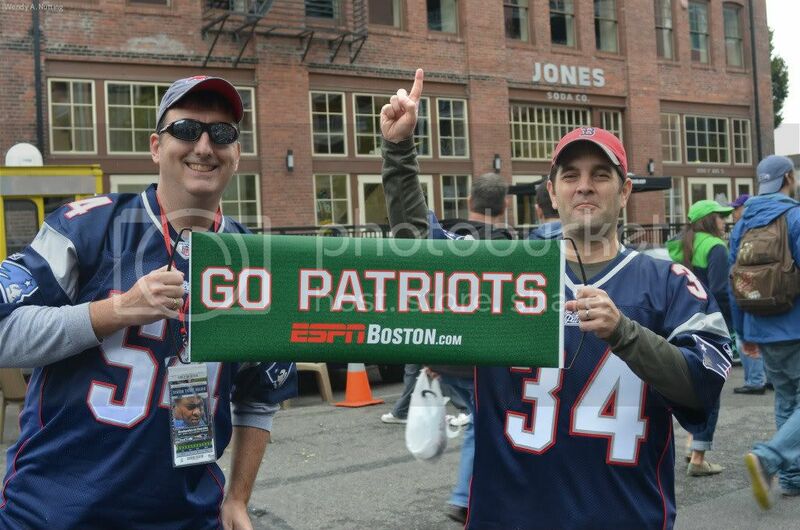 We chatted along the way with lots of people, many with ties to the east coast; who knew football could be so bonding? We had each bought our tickets separately and our seats were scattered around the stadium but we did agree to meet up after the game. Inside the crowd was massive and the smell of hotdogs, garlic fries and beer swirled as we meandered on the way to our seats. We went up, up and up to the nose-bleed section and it wasn't until the rain started to pour down that I was completely content with our dry seats. And by pour I mean the skies just opened up and dumped buckets on the field, the players and the fans. It was impressive though the loyalty of these fans, fans who were draped in ponchos, soaked from the all too famous Seattle weather, yet steadfast in supporting their teams. All I could think of was that famous quote by Bill Shankly, "Some people think football is a matter of life or death. I assure you, it's much more important than that." Now I must also mention the noise, oh my gosh the noise I could not believe the sound of that stadium, it's hard to describe and awesome to feel. It was a thunderous roar that quickly became constant and every so often it would rear its head even louder as if saying, least you forget the presence of the twelfth man. 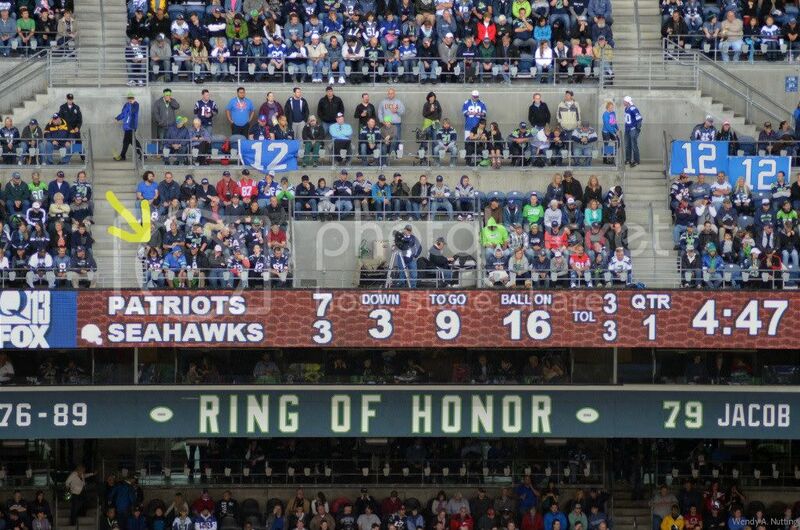 And look who we spotted just above the scoreboard, directly across the field at the 50 yard line, Shanna. I had an idea of where she was sitting and it did not take long for Clyde to find her in her Pats jersey sitting right next to a Hawk. There she is texting all her friends in Maine, "neener, neener I'm at the Patriots game, lol." They kicked, and huddled and took time outs. 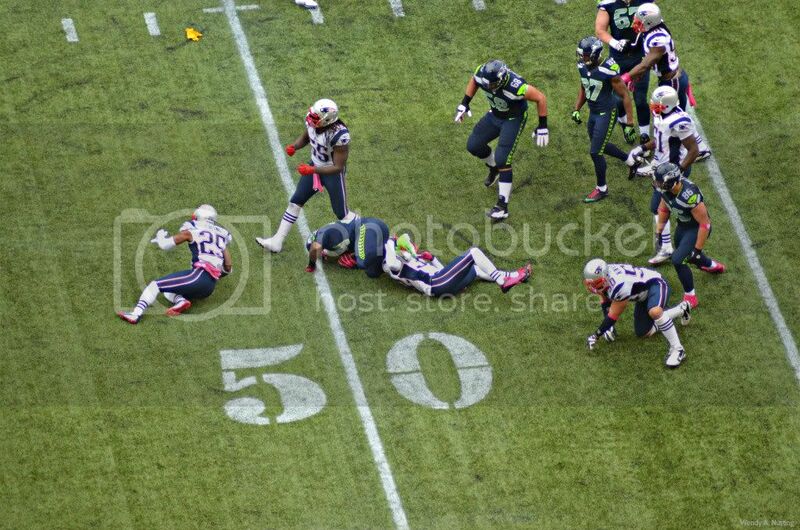 ....and they fumbled, and crashed and tackled each other on the soaking wet field. 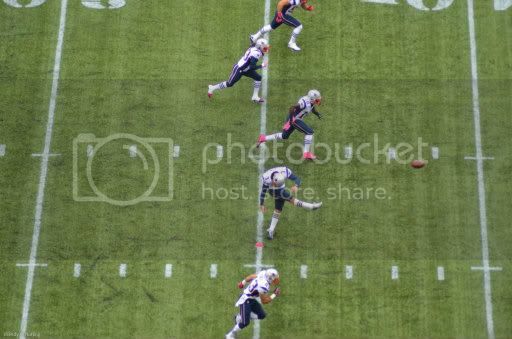 And then, with minutes left on the clock, the New England Patriots gave up a 13 point lead in the fourth quarter, losing 24-23 in a tough loss to the Seattle Seahawks. And at that very moment this eight section, 1.5 million square foot structure began to move. 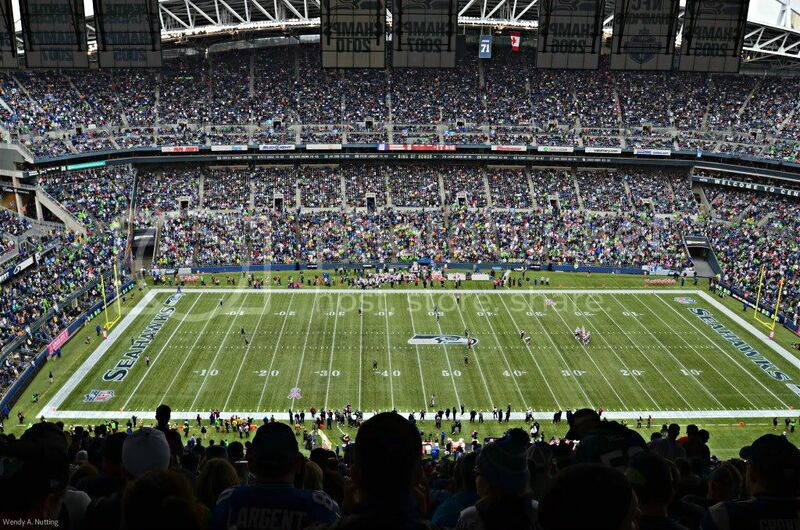 Built to withstand an earthquake, CenturyLink field sits on over 2,200 pilings driven 50 ft below the ground and it was riveting to experience the massive concrete slab floors tremble beneath my feet. 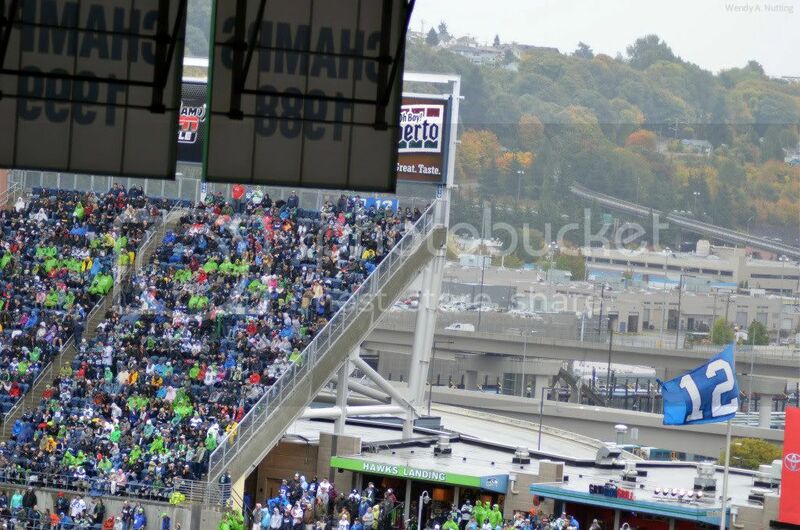 It makes you wonder if the architects goal was not only to build a beautiful stadium but to actually feel the power of the twelfth man, because at that moment the stadium was alive. After the long descent downward, we all met up post game for a beer and a bit of consolation. But mostly we laughed and reminisced and caught up on the past 24 years. It was great. 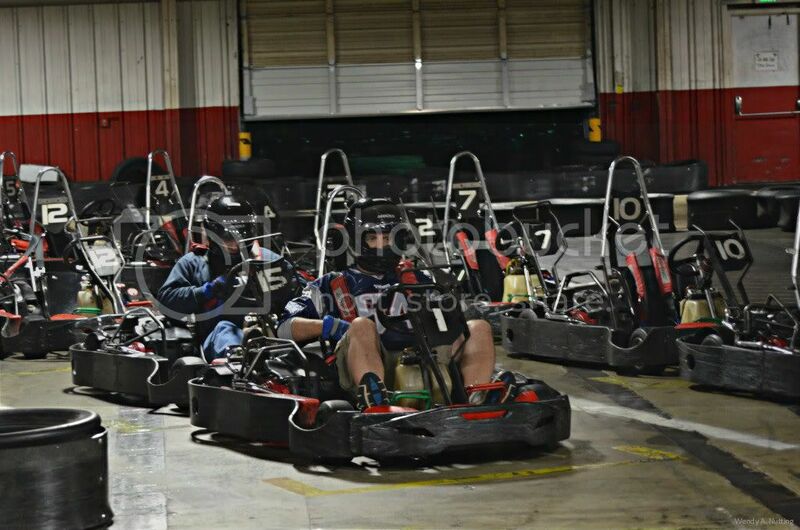 Then we decided to head North to Mukilteo, we needed a change of scenery and we ended the night with a spin around the track at our favorite go-kart course before dropping them off at their hotel by the airport. We had a wonderful time, the day was full from beginning to end and every moment unfolded better than I had planned.